Difference between revisions of "Workshops"
From time to time we provide workshops which are open to the public. Below are the workshops we have either held or are planning on holding in the near future. All handouts and/or code used in our workshops are provided here for easy reference. 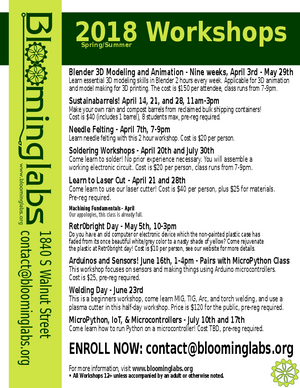 Other hackerspaces and organizations are welcome to borrow our workshops, we just ask that you drop us a line if you hold one (contact at bloominglabs.org). Since our physical space is limited, we request that all potential attendees RSVP by sending mail to rsvp at bloominglabs dot org.